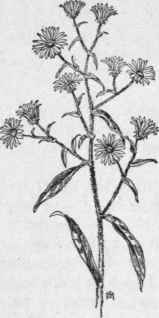 This section is from the book "A Manual Of Weeds", by Ada E. Georgia. Also available from Amazon: A Manual Of Weeds. Native. Perennial. Propagates by seeds. Time of bloom: July to November. Seed-time: August to December. Range: Newfoundland to Manitoba, southward to Virginia, Ohio, and Illinois. Habitat: Moist fields and meadows, banks of streams, swamps. Deprive the plant of its loved moisture by better drainage. Prevent seed production and starve the perennial roots by frequent close cutting, and so fertilize, cultivate, and improve the ground that better plants will supersede the weed.